Atletico Madrid are reportedly keen on another transfer raid on Chelsea for midfielder N’Golo Kante after signing Alvaro Morata this January. The Spanish giants are being linked with this rather ambitious move by Don Balon, who state Atletico seem to want to try their luck with this move due to the good relationship between the two clubs. Kante has been a hugely important player for Chelsea since he joined the club from Leicester City in 2016, helping them win the Premier League title in his first season and picking up the PFA Player of the Year award in the process. 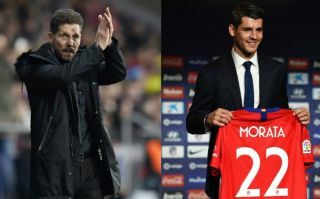 It seems highly unlikely Chelsea would let such a key player leave, unlike Morata, who had been a major disappointment at Stamford Bridge before his departure. Kante may not be playing in his preferred role this season after Maurizio Sarri decided to try him in a more advanced midfield role, but to his credit he seems to be making the most of it and showing some improvement as time goes on. Still, could a move to play under Diego Simeone and perhaps return to his more natural position be tempting for the France international? Kante, however, only recently signed a new contract with the Blues, so they’ll be under little pressure to let him go.